Yesterday we considered the 2009 Pontiac G8 GXP while indulging in a bittersweet cocktail of horsepower and history in the making. Today, we drink deep the bracing tonic of dispassionate evaluation. 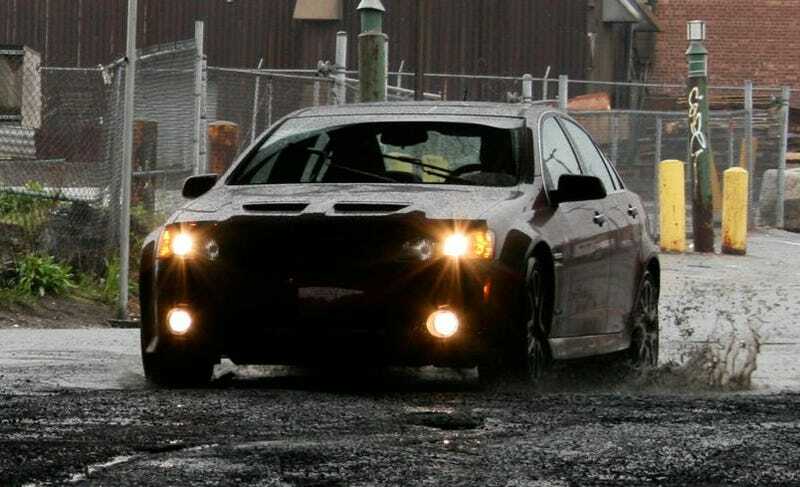 The 2009 Pontiac G8 GXP is, finally, the ultimate Pontiac — and ultimately, the final Pontiac. A tougher call than one might think, because the shape is hardly bad. To make the GXP, Pontiac took the ‘Strine Commodore Calais, gave it their nostril treatment plus two little scoops and a bit more front fascia, fitted a small rear wing and some tasteful 19-inch wheels, and then went off to work on the important stuff. It's an honest, clean, hunkered-down shape with athletic proportions, and it thankfully avoids frippery like those weakly-contoured side strakes that once made certain Pontiacs look like Tupperware accordions. Well done to those involved for leaving well enough alone. But while the understated look will certainly grow on a devoted owner, there's just no one angle or feature that really grabs the eye or the gut. While just driving or sitting in the GXP, you're fine. The seats are firm and done in perfectly adequate leather and the passengers in back have a surprising amount of room given the car's compact proportions. The steering wheel is a nice piece, as is the shifter, and the pedals are good. The instrument panel is perfectly legible and the switches and knobs are almost all in the logical places-with the glaring exception of placing the traction-control button between those for the left and right heated seats, which on one cold, drizzly morning caused me to accidentally select exactly the wrong sort of tail-happiness. Mostly, though, like the exterior, this car's interior would be perfectly acceptable if unremarkable. But the materials range from unpleasant to just flat-out bad, and so is some of the execution. The very worst components, such as the creaky parking-brake lever, the groaning sunroof and the wobbly glovebox, don't feel as if they'd last a year. From a dead stop, at highway passing speeds and on beyond what's really practical, from idle on up to the 6200-rpm power peak, the GXP will definitely and unmistakably accelerate. Empirically, it will accelerate to 60mph in 4.7 seconds and run the quarter in just over 13. Anecdotally, I found that when I got tired of leaning forward in my seat and fetching my music player from its perch atop the dash, I was able to drop down two gears, nail the throttle, and pluck my trusty iPod out of the air as it shot past my shoulder. Please note that this somehow fails to impress women. The big, robust Brembos on all four corners don't quite communicate like a true sports car's would, and they're annoyingly grabby at low speeds, but twitchiness and fade are never going to be problems. I never did get the antilock system to intrude; nice, that. It's worth mentioning that the chassis designers not only got the comfort/handling balance right, they apparently pulled off the rare trick of making the ride smoother and more supple as the car fills up with passengers and luggage. Still not a featherbed by any means, but certainly better than expected. Very balanced, very neutral, very predictable, with the only nitpick being the rather light steering. Nitpick indeed, because this doesn't in any way feel like a two-ton five-passenger car. Unlike most modern performance cars, and muscle cars in particular, the GXP doesn't mistake grip for handling. Where many cars would settle for merely clinging to the road as hard as they can, the GXP also changes direction quickly, communicates where the limits of grip lie at any given moment, and allows a driver to go confidently and safely up to those limits and beyond whenever they please. That's good, because with this engine, you'll want to try beyond a few times. Believe it. Our car had two options, the lousy $900 sunroof and the admirable and mandatory $695 Tremec six-speed. This box has good positive feel, great ratios, and nice short throws. Points off for the GM Skip-Shift, which for reasons of fuel economy forces you to go from first gear directly to fourth at part-throttle and which makes many drivers, including me, furious enough to pulp week-old puppies in my clenched fists when I'm just trying to drive in a civilized fashion and suddenly second gear is just not there anymore. And I'm a dog person. Now this is a pleasant surprise. Right or wrong, I associate GM with Bose audio, which many seem to think is perfectly fine but I think is treble-heavy with too much muddy, booming, overdriven subwoofing. The 230-watt 11-speaker Blaupunkt system in the GXP was clear and defined throughout the scale, and good rich balanced bass seemed to come from everywhere at once. I really only used the aux-in jack, but XM radio and a six-disc changer with a color info screen are right there. There's nothing really cool and unusual here, but all the stuff you'd expect is standard with the exception of a nav system. Apparently the Australian nav is illegal here by some quirk of screen angle. Instead, there's OnStar and its turn-by-turn navigation, which is frankly brilliant as it saves weight and lets you deal with actual real live people when you're lost in Baltimore, a city where at one point 40th and 41st street not only cross but eventually converge to become one and the same street for a couple miles. Staring at that on a dashboard screen would not have helped, but being talked down by an actual human voice does. Not only does it make the fabled mid-90s Impala SS look like a half-hearted hot-rod taxi, it provides the performance of an M3 sedan or an Audi RS4, and then some, for two-thirds the price. Or, if you like, half the price of an M5. A small deduction must be made for the disappointing interior and because at least one quality issue (flimsy handbrake) seems like a potentially serious problem in the making. Yes, indeed, five stars for a car with some definite problems. Yes, the fabrics, plastics, and miscellaneous materials of the cabin are such that when I gave a ride to a textile designer (no, really) she couldn't believe I could actually like the car. And yes, my head was thoroughly turned by the GXP's excellent engine and suspension and by the sheer competence with which it went down any road I cared to take. But I believe that's how this is supposed to work. A good car is greater than the sum of its parts, yet all equivocating aside, as a driver's car it's so very good that it's a little hard to believe. You could probably own and enjoy the GXP, flaws and all, for the rest of your life. So be warned: Pontiac may be dead, but if you have the opportunity to acquire one of these now and you let it go, you'll take that with you to your grave. "Remind Me Why I&apos;m An Alfa Romeo Nut?" "As I Merged Uncontrollably Into Morning Traffic, I Recalled My Last Clutch Explosion"